The freshwater pearl mussel (Margaritifera margaritifera) is an endangered bivalve with an obligate parasitic stage on salmonids. Host suitability studies have shown that glochidial growth and load vary significantly between host strains as well as among individuals of a suitable strain. Variation in host suitability has been linked to environmental conditions, host age and/or size, genetic composition of the host and parasite, or a combination of these factors. In our study, we wanted to investigate if brown trout (Salmo trutta) displayed an age-dependent response to glochidial infestation. We hypothesised that 1+ naive brown trout hosts tolerate glochidial infestation better than 0+ hosts. In order to test our hypothesis, we infested 0+ and 1+ hatchery reared brown trout with glochidia from closely related mothers and kept them under common garden conditions. This allowed us to observe a pure age dependent host response to infestation, as we eliminated the confounding effect of genotype-specific host interactions. We analysed the interaction between glochidial load and host condition, weight and length, and observed a significant age-dependent relationship. Glochidial load was negatively correlated to host condition in 0+ fish hosts and positively correlated in 1+ hosts. These contradictory findings can be explained by a change in host response strategy, from resistance in young to a higher tolerance in older fish. In addition, we also examined the relationship between glochidial load and haematocrit values in the 1+ hosts and observed that haematocrit values were significantly higher in heavily infested hosts. Our results have important conservation implications for the management of wild pearl mussel populations, as well as for captive breeding programmes. We would like to thank the staff at the Laboratory of Unit of Molecular Zoology, Technische Universität München and also the staff at the mussel rearing facility in Austevoll for all their help. 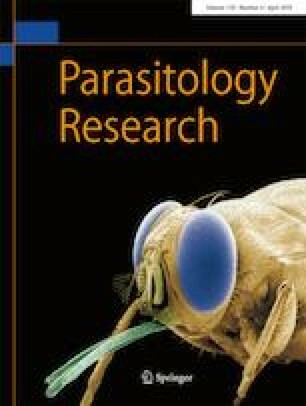 Thomas F, Guégan J-F, Michalakis Y, Renaud F (2000) Parasites and host life-history traits: implications for community ecology and species co-existence. Int J Parasitol 30:669–674. https://doi.org/10.1016/S0020-7519(00)00040-0.